The Connections series presents an ecumenical mix of traditional Bible study (NRSV) and contemporary insight. Following the Revised Common Lectionary (RCL), Connections provides your class with a plan for reading and studying the Bible. By participating in the Connections series, a believer will be given help in knowing the content of the Bible, understanding its message, and responding to that message by living a life of faith and love. Using the RCL texts creates an opportunity to connect Bible study with worship by relating the lesson text to the sermon text, and that’s one of the connections we want Connections to make. Many pastors use the lectionary to help guide their sermon ministry, so classes that follow a lectionary-based program of study should bring some helpful context to the sermon and to worship. Learn more about our move to the Revised Common Lectionary here. The Connections Teaching Guide offers suggested practical teaching procedures, options, and provides illustrative materials for each lesson. The organization of each lesson plan introduces readers to the Scripture text and lesson theme, assists readers to reflect upon and further explore the biblical text, and leads readers toward appropriate life-application of Scripture. 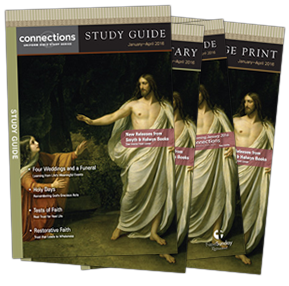 An additional resource for lesson preparation and class discussion, the Connections Commentary, by Brian Harbour, offers unique perspective, pastoral experience, professional and educational preparation, sound biblical scholarship, and love for the church and Scriptures. Brian has served as a pastor for more than forty years, including churches in Florida, Arkansas, and Texas. He received his PhD from Baylor University and has taught at the George W. Truett Theological Seminary at Baylor and at Dallas Baptist University. He is the popular author of several books, including 17 Roadblocks on the Highway of Life and Jesus the Storyteller, both from Smyth & Helwys Books. As part of NextSunday’s Coracle blog, additional helpful articles will be provided on a weekly basis by the Connections editor Mike Ruffin and a host of other writers. Current event connections. Personal stories. Questions for consideration and reflection. Even links to art, literature, movies and music. You never know what you might find that will speak to you and bring you toward a deeper understanding of the week’s lesson. View this week’s Connections online commentary here. We understand good stewardship of dollars. Our publishing schedule (every four months instead of three) saves you money on shipping. Want to go green? Connections Learner’s Study Guide, Commentary, and Teaching Guide are all available as eBooks! Lectionary-based Connections for adults provides a bridge between Sunday school and the time of worship. Bring that same meaningful connection to your youth as well with Connections for Youth. This digital youth curriculum creates a natural source of meaningful conversation between parents and their teenagers. These simple, one-page downloads for Middle School and High School provide a wealth of biblical study and discussion options for youth Sunday school teachers.